Designed and manufactured by Vaillant, the Home 15kW System Gas Boiler is a highly reliable unit. This condensing unit is wall mountable and its compact size of 740x418x300mm (HxWxD) boasts an “attractive contemporary design” and can save you valuable space around the home. As well as being compact, it’s also highly efficient and features an ErP A rating giving it a 93% ErP Rating. It also has a high SEDBUK rating of 89.3%. With an output of 15kW, this unit is perfectly suited to homes with one bathroom and not such a high demand for heating and hot water. It is also available in several other outputs, including 12kW, 18kW and 25kW which means that there’s a model for small and larger homes too. 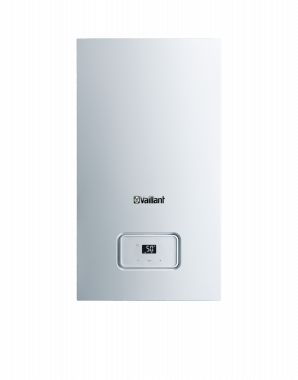 The high efficiency boasted by this boiler is thanks to several features such as a modulation of up to 1:5, a fully modulating low NOx burner, a no fill condense tap for simplicity on commissioning and full compatibility with current Vaillant controls. This unit is also user friendly thanks to a bright interface that’s easy to use, allowing you to have maximum control off the unit. As a System boiler, this unit directly heats your central heating system and hot water for a storage cylinder. Most of the important components such as the pump and expansion vessel, are built into the System boiler to make it quicker to install. This also means that you get a faster response to demand for heating and hot water. Plus, you don't need to have a feed and expansion tank in the loft like with a Regular boiler. Available with a 2 year warranty, you’ll be looked after by the manufacturer well after the installation.